The story begins when Mica Mouse is terrified by a thunderstorm outside her home. 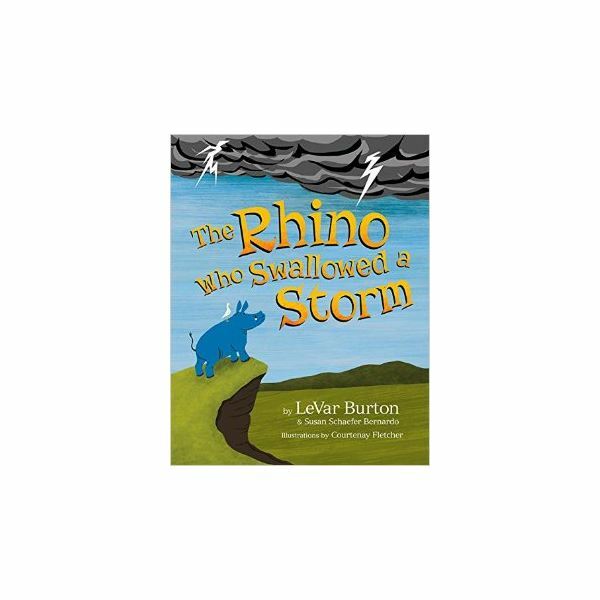 Her papa calmly picks up this storybook to read to her how a young rhinoceros is also overwhelmed by a storm that took away all things he loved. He swallowed the storm hoping to feel better, but only felt worse and embarked on a journey to healing. Along the way, he met many animal friends who uplifted him and helped to make things good again. Papa Mouse taught Mica how all kinds of people are willing to help during bad times. This story poses as a resource where children learn how to express their feelings and heal with the help of thoughtful community helpers. Read this book and take the message across the curriculum with teachable moments. Children need to learn how to open up for healing from strong emotions in life. How do children handle bad feelings such as fear, loneliness and pain? Have the children make faces that express these feelings. For examples, make a big smile for happiness, pouting for sadness, or shaking for fear, etc. Talk about what things and actions would make them feel better. The whale said to “sing your own song to feel better and happy." After all the pieces have been cut from construction paper, use a glue stick to paste all the pieces together. Take a black marker to create a mouth on the rhino’s face and either glue on googly eyes or use the marker to make a set. Have the children draw a picture using crayons and/or markers of a bad storm at their house (or any kind of disaster). Who will help them? Add these people to the picture. You can talk about community helpers such as police, firefighters, neighbors, friends, doctors, nurses and clergy.